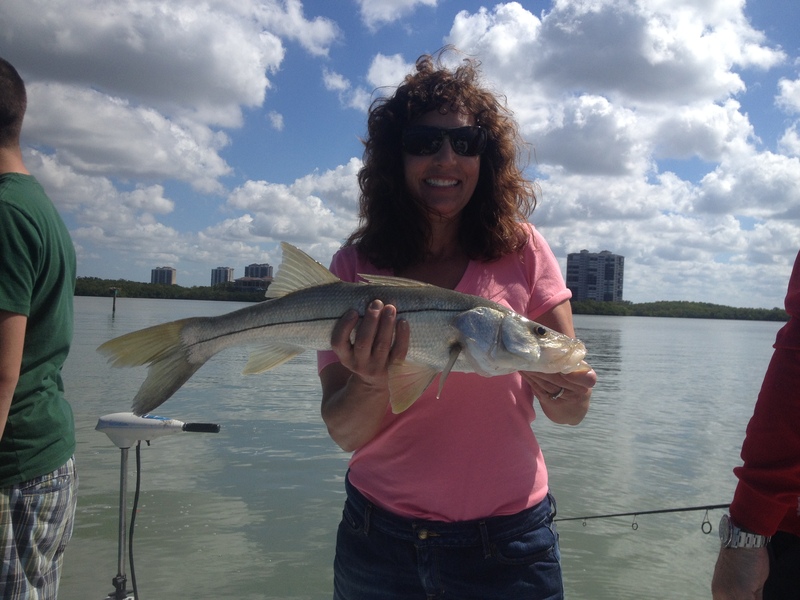 Snook Jacks and Trout in Estero Bay! Fishing this past week has been good with VERY strong incoming tides in the afternoon. I have been doing best along deeper cuts by mangrove shorelines on the first of the incoming. This week we saw tides that were just under 3 feet above mean low tide, when this happens sometimes the fish get so far back in to the mangroves that its hard to coax them out. Cut bait will sometimes do it and is not a bad idea when the water gets up really high in to the trees. Oyster beds have been holding some fish too and there are plenty of them in Estero Bay to choose from. Find one and start chumming with live bait, grab a handful squeeze them to stun them and throw them to where you think the fish are. If they are there you bait with a hook will get eaten fairly quick or you will see them being chased on the surface. Tarpon fishing is in full swing but after the last few days of the wind howling they have been harder to find. They are still off the beaches and passes and will eat a live Threadfin or Crab n a 7/0 circle hook. Do yourself a favor and use the best hooks out there “Owner”! The weather is unseasonably hot which has got the water temps up around 85 degrees which can be good and also bad. Getting an early start will help your chances as the fish will tend to eat earlier in the day. The snowbirds are almost all gone so get out and enjoy the weather and fishing our area has to offer!